We share important meals with our families and friends, obsess over menus, and even photograph our food. But what is the social value of our fare and how we prepare and serve it? Last spring, University of Vermont instructors Margaret Tamulonis and Jennifer Dickinson posed that question to their “Introduction to Museum Studies” class. Dickinson, an associate professor of anthropology, and Tamulonis, the Fleming’s manager of collections and exhibitions, chose the subject of the show and some of its art ahead of time. The Honors College sophomores in their class culled the rest of the objects from the Fleming’s collection and wrote the labels and other show information. “Food seemed to be really rich. We definitely wanted to do a show that was very much about people pondering their own food practices,” Tamulonis explains. The items the students curated cover an incredible range of food-related history. Among them are an offering slab on which the Egyptians placed treats for the dead 3000 years ago and a restaurant pager from UVM’s University Dining Services that lets students know when their meals are ready. 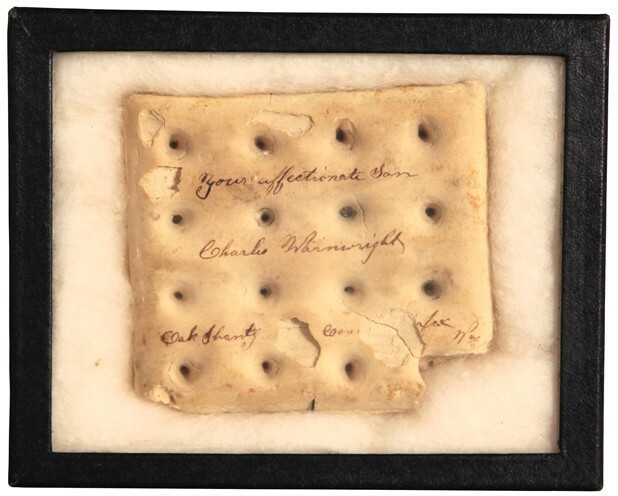 Homegrown Vermont pieces include a morsel of hardtack signed by 12th Vermont Infantryman Charles Wainwright, who sent it to his parents as a letter during the Civil War; Burlington Stoneware butter churns from the 1850s; and a cake mold and recipe book of similar vintage. Modern Vermonters are invited to get in on the act, too. Museum visitors will be able to share their own food photographs — and submit them for possible inclusion in the show — by emailing fleming@uvm.edu or contacting @flemingfood on Twitter or Instagram.